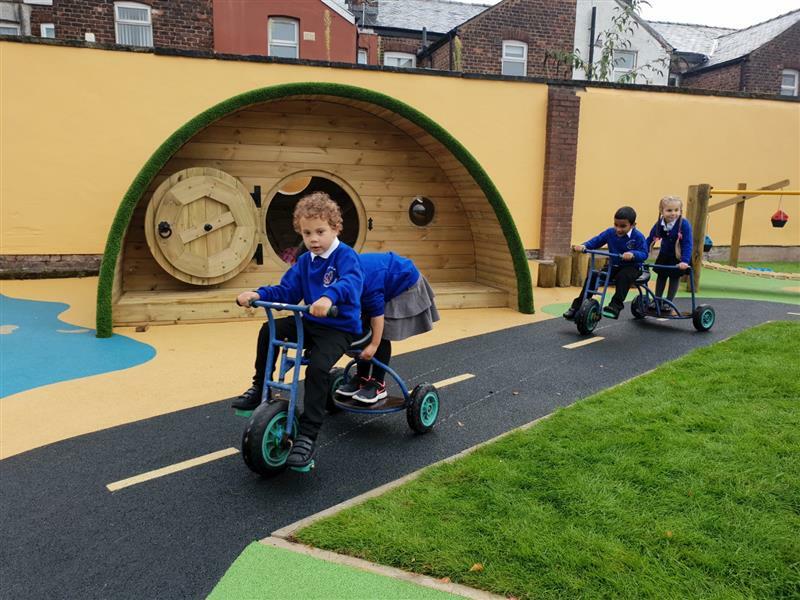 The Early Years children at St Chrysostom’s CE Primary School in Manchester are having the most wonderful experience of starting school this September, thanks to a fabulous new outdoor learning environment installed by Pentagon Play. Our Sales Director and Outdoor Learning Expert, Paul Bayliss, worked closely with the Manchester Primary School to create a beautifully natural-looking outdoor space that provides a complete range of interactive, educational and physically challenging activities that inject some real fun into the school day for this young age group. It will certainly help them to settle in and look forward to going to school every day! After removing all the old equipment, our team began the installation. Key to improving the area was to ensure that this would be an outdoor play space that is safe and easy to use all year round. We created a fun, bespoke “land and sea” themed Wet Pour surfacing with soft sand, grass green and gentle blue colours. This not only sets the scene itself for some brilliant imaginative play, but it prevents waterlogging and reduces the risk of injury from falls. The friendly Giant Green Turtle in the middle is a real focal point and the children love to sit on his back! 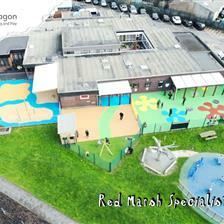 Wetpour is also a brilliant way of incorporating educational aspects into the Surfacing. Our giant Alphabet Snake invites the children to follow his literacy path, and a large Numerical Clock helps to teach counting and time telling. We used Thermoplastic Markings to create a true-to-life Roadway circuit track, with road markings, zebra crossing and parking bays. 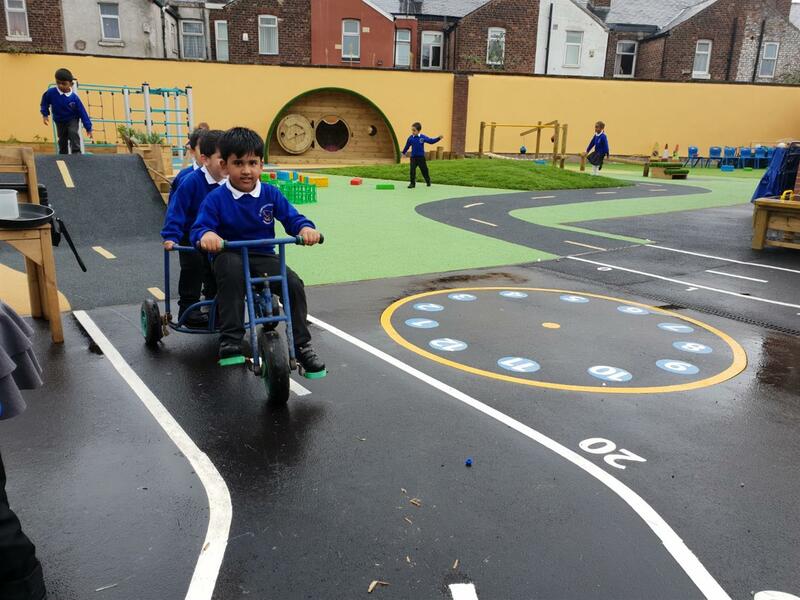 It’s perfect for children to whizz around on their bikes and trikes, exercising, developing gross motor skills and learning about road safety as they go. An Up and Over Ramp incorporated seamlessly into the track, with a Climb Through Tunnel under, provides a multi-dimensional physical challenge. Children learn to control their pace and develop the strength needed to ride over it. Their faces light up as they challenge themselves to march or pedal up and fly down the other side! 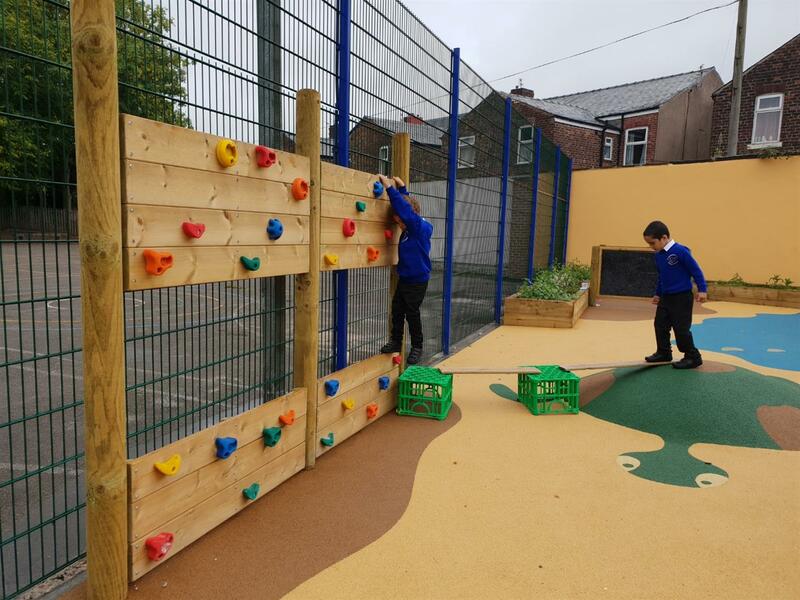 Adjacent to the roadway circuit we installed a superb Adventure Play area which offers the children a number of different fun and physical challenges. 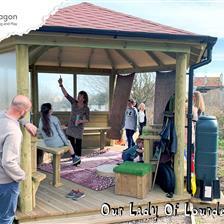 These outdoor learning activities are perfectly complemented by an inspiring Role Play and Creativity Area. Our Hobbit Play House is a striking playground feature piece, and the children at St Chrysostom’s are thoroughly enjoying theirs! It’s a cosy den, with a secret round door and magical bubble windows which give it a totally unique look. With a curved Artificial Grass topped roof, the Hobbit House blends in with the landscape and feels like a real underground burrow waiting for their imaginations to take the lead! We included a Giant Mirror on Posts, a Playground Mound and Den Making Posts to add to the creative, hillside theme, and to encourage the children to explore, design and build their own dens too. Messy Play provision is an absolute must in any Early Years outdoor playground. St Chrysostom’s have really maximised their messy play facilities with the installation of our expertly designed Water Wall with Water Play Package. Connected to an outdoor water supply, it allows children to get hands on and build their own course for the water to flow through. They can get experimenting with scientific concepts and learn about all sorts of topics such as gravity, flow, kinetic energy, the water cycle, recycling, mass, volume and weight, through high level, interactive, kinesthetic learning. St Chrysostom’s have included with their messy play provision our firm favourite Original Mud Kitchen, along with a Covered Mud/Sand Box and a fantastic set of Timber Weighing Scales. The children love the sensory experience of getting their hands dirty making all sorts of concoctions. These are great outdoor learning resources for encouraging children to interact socially with one another, explore and experiment with new concepts, and develop new vocabulary associations and understanding of language. For Outdoor Reading and Storytelling we installed our popular Story-Telling Chair - a gorgeous wooden chair that allows the reader (adult or child) to sit comfortably and look out and be seen by all of the group. Perch Benches placed in front of it allow the children to sit comfortably and absorb themselves in the story. It’s the perfect setting for quiet listening, conversation around a theme and sharing stories together year round. Mark Making is encouraged at all times in the Early Years playground at St Chrysostom’s. We installed Giant Chalkboards and Giant Whiteboards on Posts to allow children plenty of space to practice their art and letter formation. 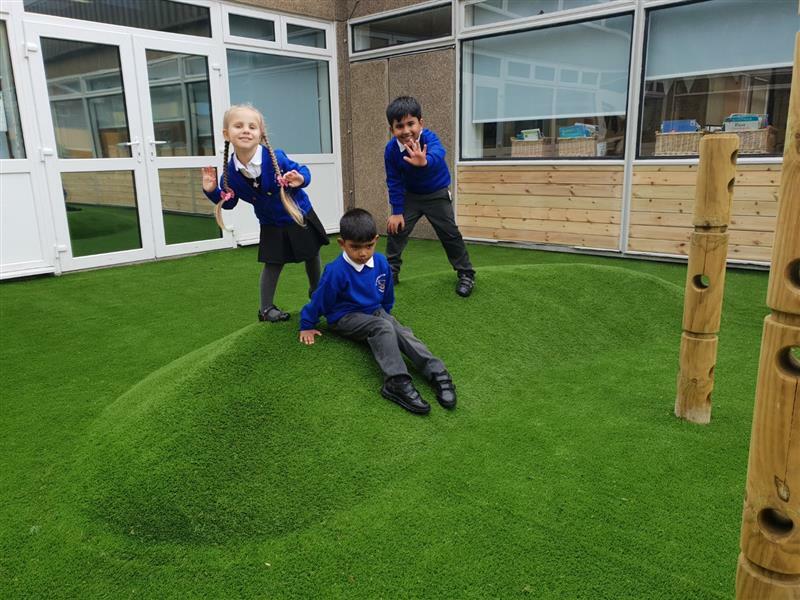 The addition of four Small Moveable Artificial Grass-Topped Seats ensures that there is always somewhere comfortable for children to sit back, have a rest and survey their handy work! Finally, to break up the spaces, and to add a natural, sensory dimension to the outdoor learning experience, we installed some attractive Wooden Planters and Planter Benches. The children can really take ownership of these features and enjoy planting them with a range of beautiful sensory plants, flowers and herbs. They attract wildlife and offer the children an essential first-hand experience when it comes to learning all about the natural world around us, whether studying life-cycles, or learning about the effects of the weather and our seasons. 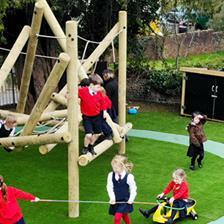 You can explore our range of Natural Play Resources Here. 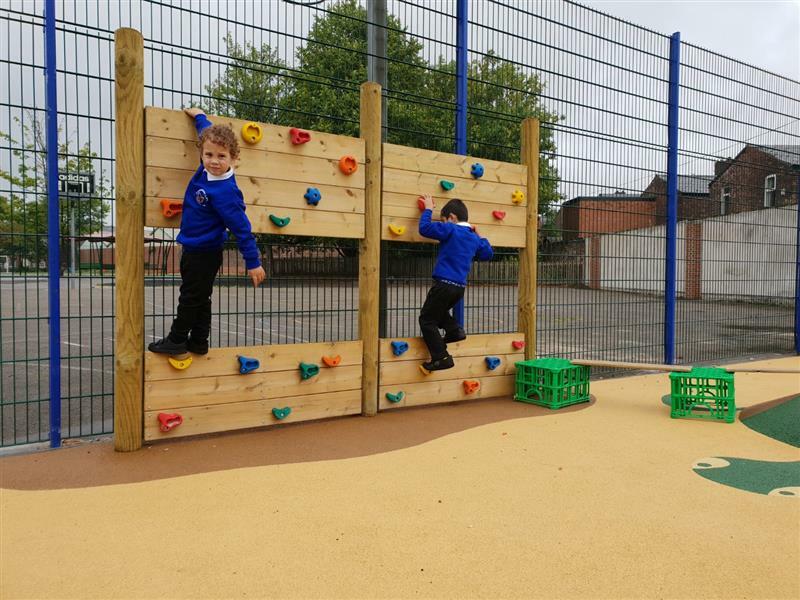 The new Early Years playground at St Chrysostom’s was professionally designed by Pentagon to make maximum effective use of all the space available. The multiple play and learning options within this inclusive, spacious area means that there is plenty to keep everyone occupied. Each day, children will learn about turn taking and this really helps to promote good behaviour. We were delighted to have the opportunity to go back and visit the children playing after the installation. There were lots of happy faces and they were all very busy enjoying themselves! We are sure that all the new starters at St Chrysostom’s will feel welcomed by the space, and it will help them to feel settled and excited about their wonderful learning journey ahead! 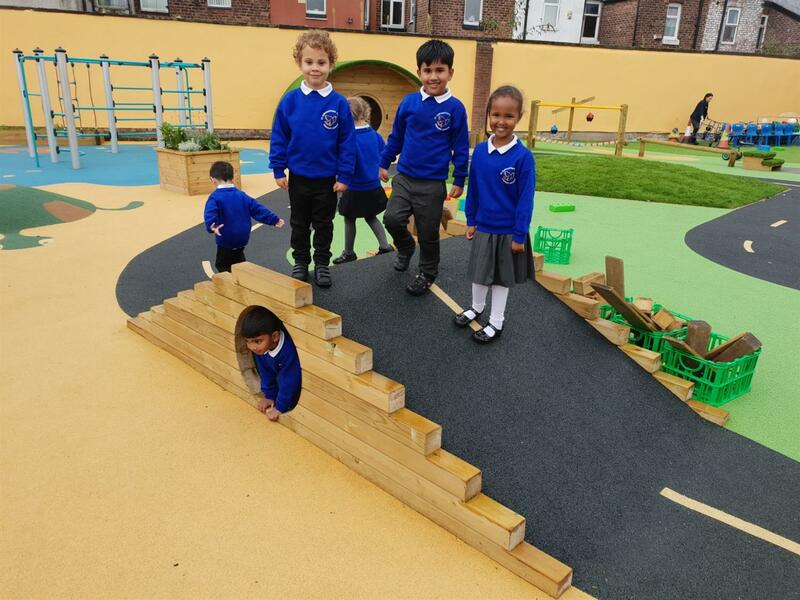 If you'd like to view more of our amazing outdoor learning environments and explore our huge range of early years outdoor play equipment, visit our EYFS Page Here. If your EYFS outdoor learning environments needs some new inspiration, you can arrange a free consultation with one of our outdoor learning experts by completing our Online Form. Alternatively, you can call 01625 890 330 (Northern office) or 0117 379 0899 (Southern office).